BERLIN (AP) — A 94-year-old former SS sergeant who served as a guard at Auschwitz was sentenced to five years in prison after being found guilty Friday of 170,000 counts of accessory to murder on allegations he helped kill 1.1 million Jews and others at the Nazi death camp in occupied Poland. Reinhold Hanning admitted to the Detmold state court during his trial that he volunteered for the SS at age 18 and served in Auschwitz from January 1942 to June 1944, but said he was not involved in the killings in the camp. Despite his age, Hanning seemed alert during the four-month trial, paying attention to testimony and occasionally walking in to the courtroom on his own, though usually using a wheelchair. Several equally elderly Auschwitz survivors testified at the trial about their own experiences, and were among about 40 survivors or their families who joined the process as co-plaintiffs as allowed under German law. Leon Schwarzbaum, a 95-year-old Auschwitz survivor from Berlin who was used as slave laborer to help build a factory for Siemens outside the camp, told the court at the start of the trial that he regularly saw flames belching from the chimneys of the Auschwitz crematoria. 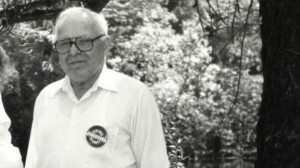 Schwarzbaum later said he does not want Hanning to go to prison and is happy that he apologized, but had hoped that he would have provided more details about his time in Auschwitz for the sake of educating younger generations. “The historical truth is important,” Schwarzbaum said. Hanning joined the Hitler Youth with his class in 1935 at age 13, then volunteered at 18 for the Waffen SS in 1940 at the urging of his stepmother. He fought in several battles in World War II before being hit by grenade splinters in his head and leg during close combat in Kiev in 1941. He told the court that as he was recovering from his wounds he asked to be sent back but his commander decided he was no longer fit for front-line duty, so sent him to Auschwitz, without him knowing what it was. Though there is no evidence Hanning was responsible for a specific crime, he was tried under new legal reasoning that as a guard he helped the death camp operate, and can thus be tried for accessory to murder. Though the indictment against Hanning focused on a period between January 1943 and June 1944 for legal reasons, the court said it would consider the full time he served there. The same argumentation used in Hanning’s case was used successfully last year against SS sergeant Oskar Groening, to convict him of 300,000 counts of accessory to murder for serving in Auschwitz. Germany’s highest appeals court is expected to rule on the validity of the Groening verdict sometime this summer. Groening, 95, was sentenced to four years in prison but will remain free while his case goes through the lengthy appeals process and is unlikely to spend any time behind bars, given his age. In Hanning’s case, prosecutor Andreas Brendel recommended six years in prison while his defense attorneys argued for an acquittal, rejecting the new legal reasoning. The precedent for both the Groening and Hanning cases was set in 2011, with the conviction in Munich of former Ohio autoworker John Demjanjuk on allegations he served as a Sobibor death camp guard. Although Demjanjuk always denied serving at the death camp and died before his appeal could be heard, it opened a wave of new investigations by the special prosecutor’s office in Ludwigsburg responsible for Nazi war crime probes. The head of the office, Jens Rommel, said two other Auschwitz cases from that renewed effort are still pending trial — another guard and also the commandant’s radio operator, contingent on the defentants’ health, which is currently being assessed — and a third is still being investigated by Frankfurt prosecutors. Rommel’s office, which has no power to bring charges itself, has also recommended charges in three Majdanek death camp cases, and has sent them on to prosecutors who are now investigating. Meantime, the office is still poring through documents for both death camps, and is also looking into former members of the so-called Einsatzgruppen mobile death squads, and guards at several concentration camps. Rommel said even though every trial is widely dubbed “the last” by the media, his office still plans on giving more cases to prosecutors and politicians have pledged to keep his office open until 2025. A 92-year-old former SS guard accused of complicity in the murders of 260,000 people at the Auschwitz death camp will undergo medical evaluation to determine if she is fit to stand trial for her participation in Nazi Germany’s genocide of European Jews. German prosecutors have alleged that Helma M., who served as a radio operator for camp commander Rudolph Hess in 1944, received details of incoming shipments of Jews to be murdered at the Nazi camp. An estimated 1.2 million European Jews and other victims of Nazi Germany were murdered at the camp in occupied Poland. Among the 6,500 former SS personnel at Auschwitz who survived the war, fewer than 50 have been convicted to date. Medical experts are expected to present an evaluation of Helma M. to the Kiel District Court in Northern Germany next month, a Saturday report in the UK’s Daily Mail said. Described as “deaf and frail,” her defense has maintained the nursing home resident is unfit to stand trial for her complicity in Nazi war crimes. Despite camp duty rosters that reportedly confirm she was in Hess’s service from April to July 1944, Helma M. escaped prosecution at the end of the war because no evidence that she personally harmed any Auschwitz inmates during her time at the camp was ever presented to German courts. 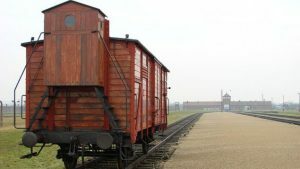 In recent years however, Germany’s laws regarding the prosecution of former Nazis has shifted, and now defines suspects’ involvement in death camps as sufficient grounds for culpability in Nazi war crimes, even without proof of committing a specific crime. As a result, a wave of new investigations into former Nazi guards, medics and other camp workers has led to a handful of trials against a dwindling number of aging suspects. In 2015, Jens Rommel, Germany’s top Nazi hunter, charged Helma M. with complicity in the murders of 260,000 people in the Auschwitz death camp. In her role as a radio operator, Rommel claimed she received and transmitted details of the number of people to be exterminated — most of them Hungarian Jews — between April and July 1944. “Helma M. was involved in the so-called ‘Hungarian Action’ which saw the destruction of at least half the Jewish population of Hungary,” Rommel said on Saturday according to a report in the Mail. “Three to four trains arrived daily. Of 360,000 people, at least a quarter of a million of them were murdered immediately, most of them women and children unfit for work,” he said. Rommel — who bears no relation to Hitler’s Field Marshal Erwin Rommel — said the murders of the Jews were coordinated in the command area where she worked, and she would have undoubtedly known of their fate. “We have learned from other interrogations that people in the command center talked of the daily events, and as such we say she was a part of the murder machine which made Auschwitz function,” he added. 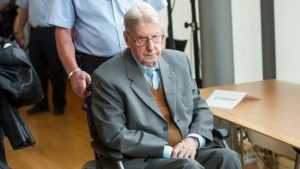 In a separate trial against a former Auschwitz guard, German defense attorneys on Saturday called for the acquittal of Reinhold Hanning, claiming the trial failed to produce evidence the defendant was directly involved in specific crimes against Nazi victims. According to the German news agency dpa, defense attorney Johannes Salmen told the Detmold state court in his closing remarks that Hanning never killed or beat anyone, or helped others do so, and that he was never in the part of the camp where the gas chambers were located. Prosecutors are seeking a six-year-prison sentence. They argue that Hanning is guilty of being an accessory to murder in at least 100,000 cases because, as a guard, he helped the death camp function. In April, Hanning admitted to serving as an Auschwitz guard. He said he was ashamed that, although he was aware Jews were being gassed and their corpses burned, he did nothing to try to stop it. Hanning did not take the opportunity to make a closing statement himself. A verdict is expected on Friday. Groening was sentenced in July to four years in prison, even though he had previously been cleared by German authorities after lengthy criminal probes dating back to the 1970s. Another case is currently being heard by a German court against former SS medic Hubert Zafke, 95, who is charged with at least 3,681 counts of complicity in killings. That case has however been suspended twice due to the defendant’s poor health, raising questions on whether it can proceed. BERLIN — Germany’s highest criminal court has ruled that the country has jurisdiction over the case of a retired Minnesota carpenter that an Associated Press investigation exposed as a former commander in a Nazi SS-led unit. German police have arrested a former Nazi medic who served at the Auschwitz death camp on multiple charges of aiding and abetting murder. The 93-year-old, who was arrested at his home near Neubrandenburg, north of Berlin, underwent a medical checkup before he faced a judge and was then taken into pre-trial detention. 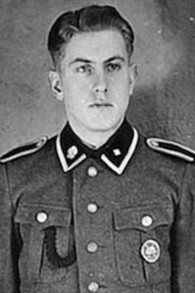 The former SS member allegedly assisted in the mass murder of prisoners who arrived on eight transports from Germany, Austria, France, Italy, the Netherlands and Slovenia in September 1944. Of the arrivals, 1,721 were killed in gas chambers after they were deemed unfit for forced labour at the Auschwitz-Birkenau camp in Oswiecim, southern Poland, prosecutors said. BERLIN — Hans Lipschis, reportedly one of the 10 most wanted Nazis, was arrested in Germany. 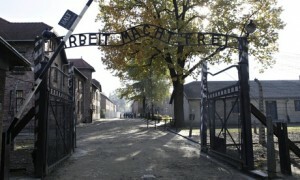 Lipschis, 93, of Aalen is facing charges of complicity in murder as a former guard at the Auschwitz extermination camp. He was arrested on Monday. According to German news reports, state prosecutors in Stuttgart are preparing an indictment against Lipschis, a native of Lithuania who was an Auschwitz guard from the fall of 1941 until the Nazis abandoned the camp in January 1945. Lipschis reportedly belonged to the Totenkopf-Sturmbann, or Death’s Head Battalion, that guarded the camp. He later became a cook for SS troops at the camp. In April, Lipschis told the German newspaper Die Welt am Sonntag that he was in Auschwitz “as a cook, the whole time.” Lipschis reportedly moved to the United States in 1956, but was expelled in 1982 after immigration authorities determined that he had lied about his Nazi past in order to gain entry into the United States. His arrest follows the announcement last month by Germany’s Central Office for Clarification of Nazi Crimes, based in Ludwigsburg, that it had provided information about 50 former Auschwitz guards to German courts, with the aim of assisting in possible war crimes trials. All the suspects are around 90 years old. The development was triggered by the 2011 guilty verdict in Munich against former death camp guard John Demjanjuk as an accessory to murder of nearly 29,000 Jews at Sobibor in Poland. There were no direct witnesses to Demjanjuk having physically committed murder himself, but there was sufficient evidence that he was a guard at the camp. AUSTRALIA’S strategies for bringing alleged Nazi war criminals in this country to justice are fundamentally flawed, according to a key anti-Nazi campaigner. 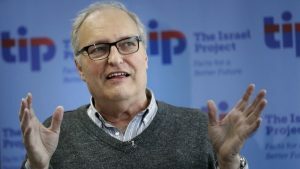 Broadcaster and historian Mark Aarons said Australia deserved to languish in the Simon Wiesenthal Centre’s lowest category after the organization gave Australia an “F” in its finding of nations’ efforts to bring fugitive Nazis before court. Aarons said Australia stood apart from other Western democracies with large intakes of displaced persons (DPs) after World War II, as it did not seek to prosecute alleged Nazis and collaborators for breaches of immigration law, unlike the United States and Canada. Australia accepted some 180,000 DPs, second only to the US, which took around 250,000, with Canada third. Canada, like Australia, had tried to conduct war-crimes trials but when witnesses and evidence became too old and unreliable, Canada copied the US model of prosecuting individuals for lying about their past to obtain entry permits. Australia did not follow that path, Aarons said. Under former prime minister Bob Hawke, Australia briefly conducted war-crimes trials from 1986 to 1991 after Aarons’ landmark 1986 ABC radio documentary Nazis In Australia brought the issue to prominence. “Except for the Hawke period, every other government has been a failure,” Aarons told The AJN this week. “Every other government has thrown up its hands and refused to put any effort into it at all. Aarons slammed last year’s High Court ruling rejecting the extradition of Perth man Charles (Karoly) Zentai to his native Hungary over the 1944 murder of 18-year-old Budapest Jew Peter Balazs. The case was cited in the Wiesenthal Centre report as “the most disappointing result in a specific case during the period under review”.